Welcome to my Poundlane. In the pages of this site I hope to share what I know about breeding healthy functional dogs, and help you to answer some of the questions you have about getting a dog. Below is a bit about me, so have a good look around and hopefully enjoy! I am a hobby breeder. Breeding for HEALTH, HAPPINESS AND TEMPERAMENT. The dogs we breed are very sweet natured dogs who really enjoy human companionship and family life. I live in the rolling glorious North Devon countryside, England, United Kingdom with my husband, David and our children. I have been surrounded by this lovely breed since a small child back in the late seventies. 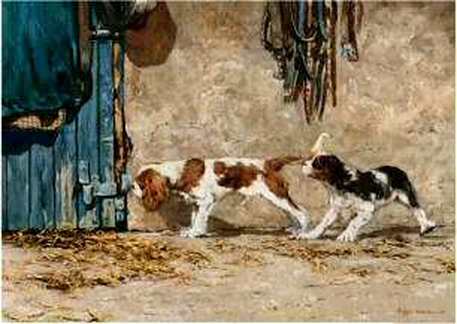 Along with Cavaliers I was brought up with dogs not only as pets, but to work. With also an agricultural background, breeding has always had a strong grounding for breeding dogs to function, so health and temperament are priorities. Health and temperament are very much part of our breeding strategies. The Cavalier unfortunately has not kept to it's original breeding ideology, when separated from the King Charles spaniel, to get back to being a healthy sporting little spaniel, and is now beset with so many health problems, the only way forward we feel to salvage this breed is to crossbreed. The reason I put so much time and energy in to breeding a more healthy type Cavalier (small spaniel) is because they are just wonderful little dogs, and are possibly one of the best (if not the best) tempered type of dog with children. 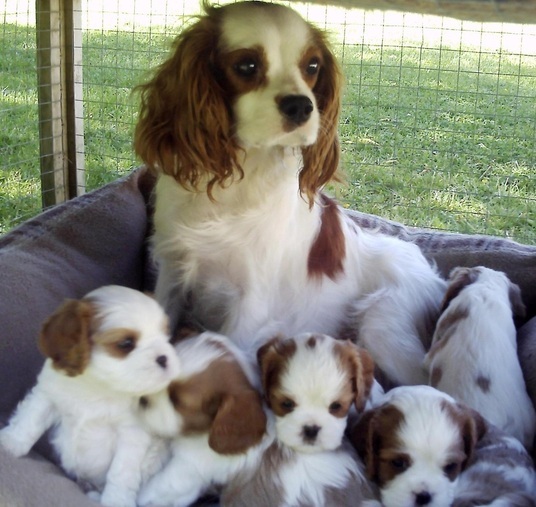 ​Our first tentative steps in to crossbreeding with the Cavalier was with using the Poodle (miniature) in 2009, which produces a lovely little dog and these crossed back to the Cavalier produce a beautiful elegant small spaniel with a less extreme phenotype. In 2019, we are now three generations on from our first crossbreed litter, also bringing in the Brittany spaniel which has given brilliant results in giving a better healthier head conformation. At Poundlane we work to keep up to date on genetic news, health issues and health tests for our dogs and take full advantage of the health testing schemes that the Breed Clubs and British Veterinary Association/Kennel club run and genetic tests as they become available. Articles on health issues can be found regularly on our blog What's going on at Poundlane. We use crossbreeding at Poundlane in an attempt to improve health of the Cavalier and produce a less exaggerated in conformation, small robust spaniel. More about our spaniel breeding project and mission can be read about on The POUNDLANE Spaniel page. This website has not been created just to promote Poundlane, but to help people wishing to bring a puppy into their family, to understand what they are undertaking, and how to recognize a good breeder. Which can be read about on the Guide To Buying A Puppy page, and also our blog What's going on at Poundlane has useful articles on it about puppies and dogs. A book that can be useful to read before getting a puppy is "The Perfect Puppy." by Gwen Bailey. Litters we are planning can be read about on the Litters page. ​Please take a good look around, and I hope this website is a help to you. If after reading our website you are interested in what we are doing at Poundlane. You can then contact me (Jane) by phone at 01769 560969 for a friendly chat or email me at howarthmurch@btinternet.com ​to be told to ring me for a chat.